Descripción del libro: Una antología crítica de textos literarios del mundo hispanohablante. Se enfoca en autores canónicos y también se intenta incluir voces marginadas. Cada texto tiene una introducción y anotaciones creadas por estudiantes. // A critical anthology of literary texts from the Spanish-speaking world. A focus on canonical authors and an attempt to include voices that have been marginalized. Each text includes an introduction and annotations created by students. This Anthology was put together by Dr. Julie Ward and the students in her Introduction to Hispanic Literature course. We are looking for faculty to implement a similar Edición Crítica assignment in their classrooms to produce student-created critical editions that will expand the Anthology. If you are interested, let us know in the Rebus Community Forum. 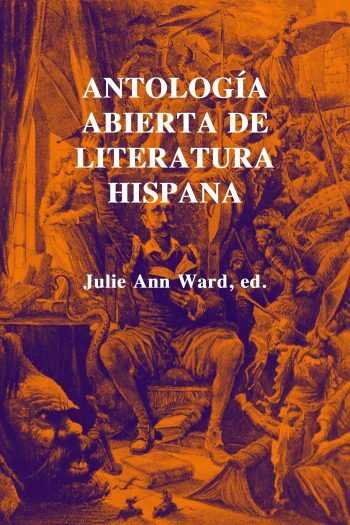 This book is a cloned version of Antología abierta de literatura hispana by Julie Ann Ward y ed., published using Pressbooks by under a CC BY (Attribution) license. It may differ from the original.